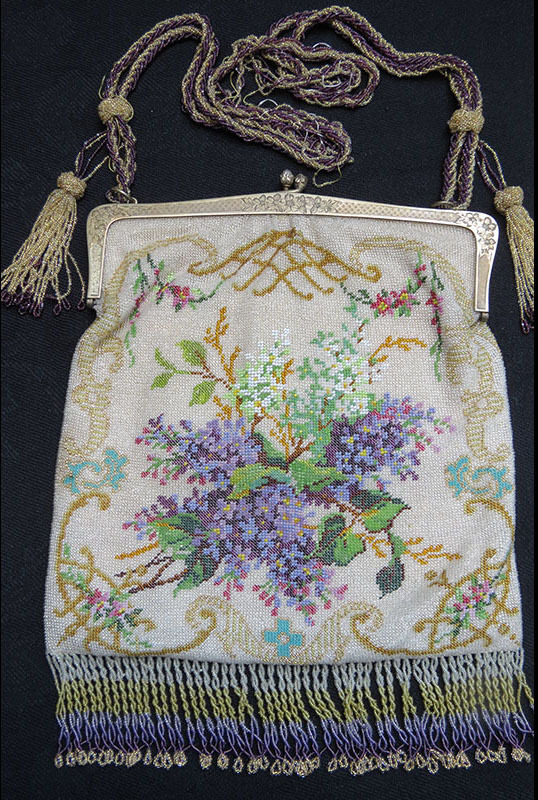 I can’t recall when I fell in love with beaded purses, but it probably was the first time I held a vintage bag of tiny, tiny beads. It was silky-smooth, cool, as flexible as fabric, with a texture I had never felt before. And the colors – lavender flowers against a white background – were beautiful! I was hooked! I started collecting with that first bag and haven’t stopped, though my buying has slowed down as I’ve become more select and as prices for good quality bags have sky-rocketed. 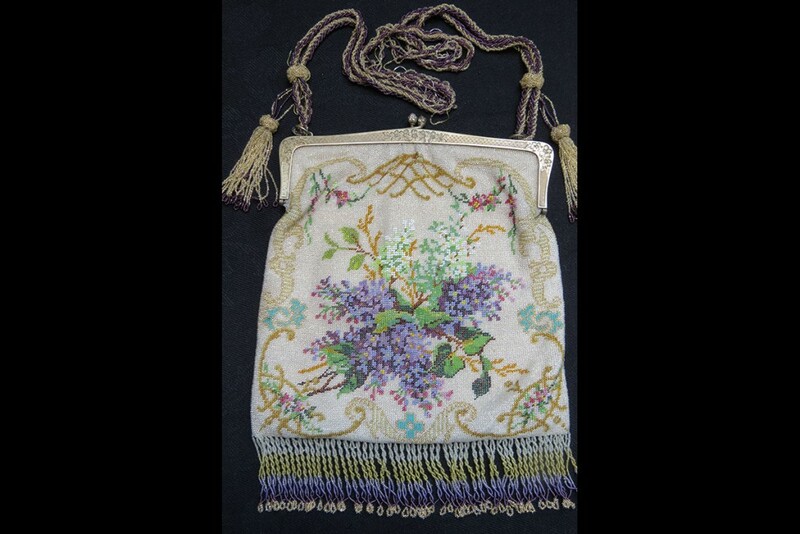 I typically say that I collect Victorian beaded bags, to distinguish them from the mass-produced bags of the last few decades that many of us carried to our high school proms. But in truth, my collection spans the nineteenth century and well into the 1920s and 1930s. 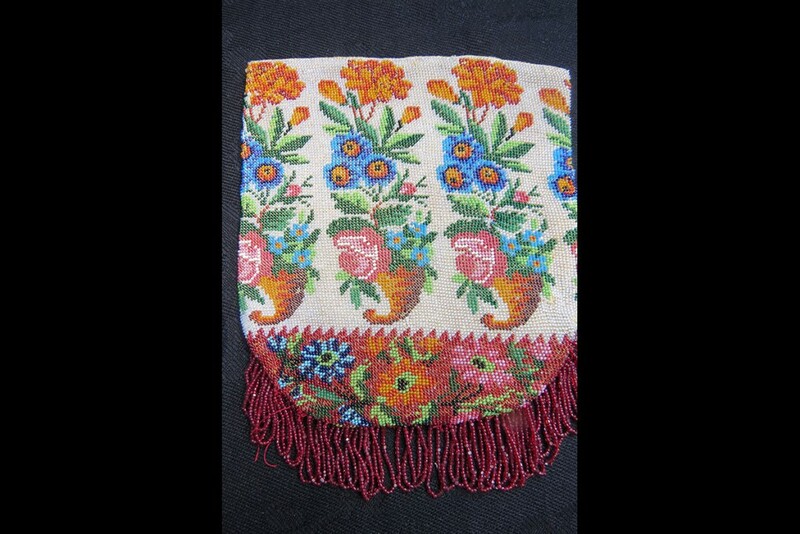 Many of the bags are knit or crocheted in the round, and some were done as flat pieces on bead looms, then stitched together. Some have steel-cut and other metal beads, but most are glass. 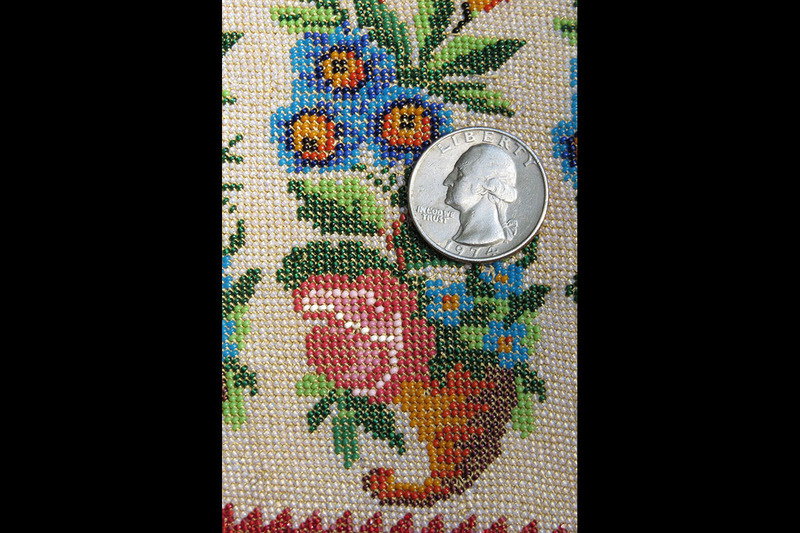 It’s not always easy to tell what method was used when beads are tightly placed next to each other, and the lining is intact, making it impossible to see the stitches behind the beadwork. 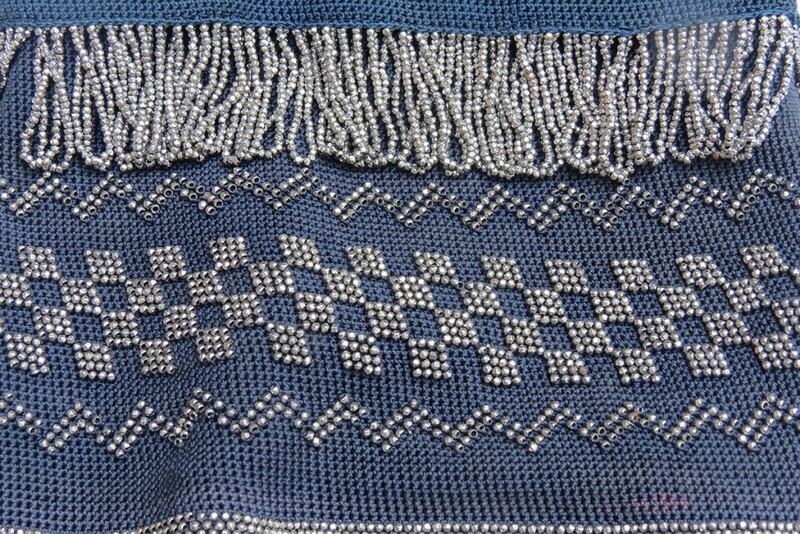 In the purses where beads are used to embellish the stitches, not to cover them, it’s easier to determine the technique – most of those are crocheted. Most of the bags with solid beadwork are knit. Some are large, and others small, either for a child or to be used as a coin purse. 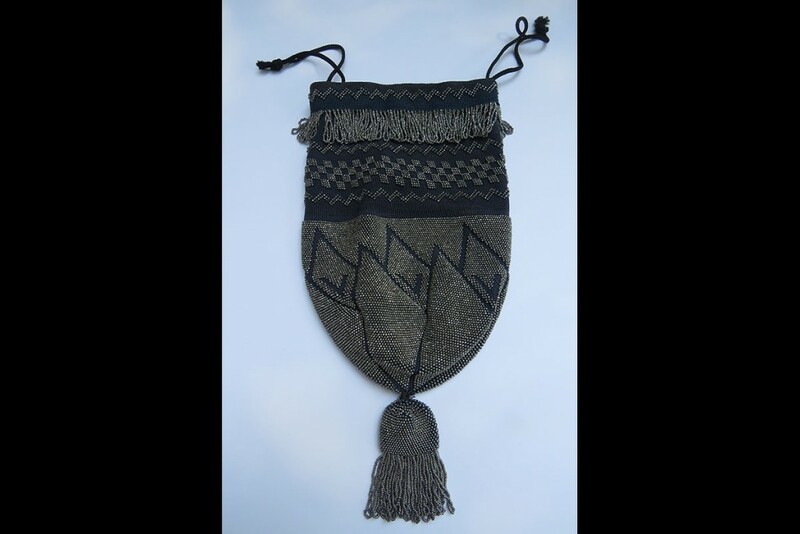 Some have simple drawstring handles and others are sewed to silver frames that clasp together and have a silver chain. 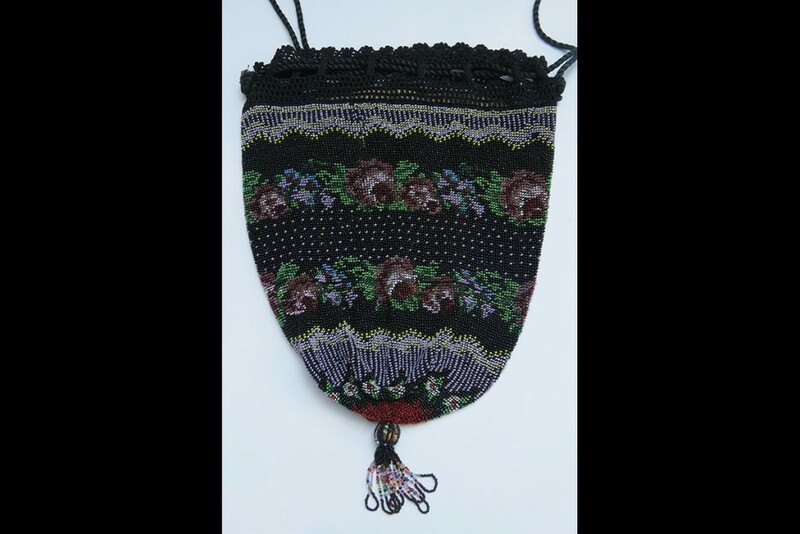 I’ve also collected some vintage patterns for beaded bags, and years ago, I took a one-day class to learn to knit a beaded bag. 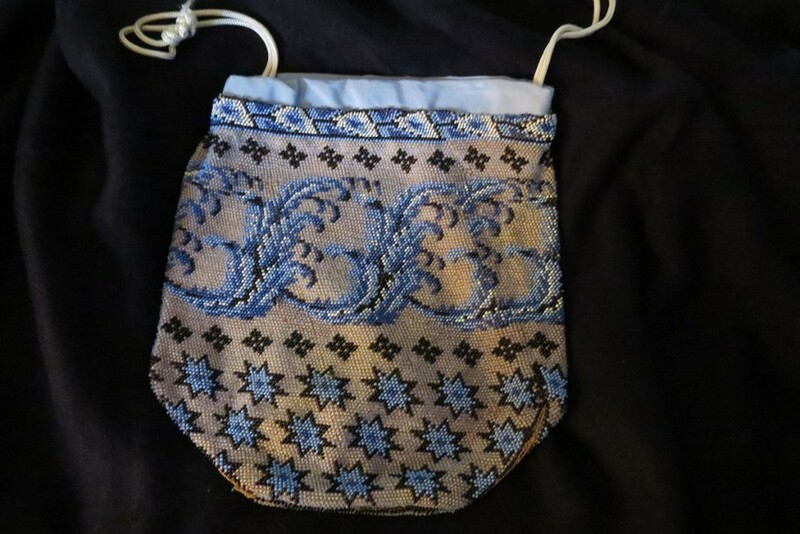 The finished project was to be a small bag, necklace- not purse-size. 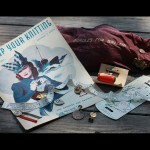 I must confess when the instructor handed out our double-point size 0000 knitting needles and thread not much thicker than sewing thread, I realized I’d probably never be able to knit a purse as wonderful as the patterns I had seen. 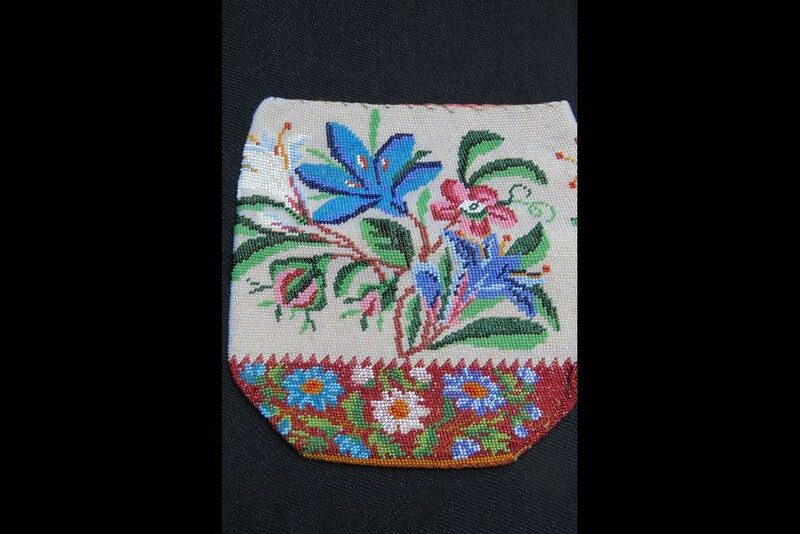 But I did get a real sense of the technique for many of the bags in my collection and the hours and dedication that went into this handwork. We learned to string the beads (solid color for this first attempt) and to knit our small bags. Using size 0000 needles took some getting used to, and the metal needles slipped out of the stitches easily, so my first attempts were frustrating. 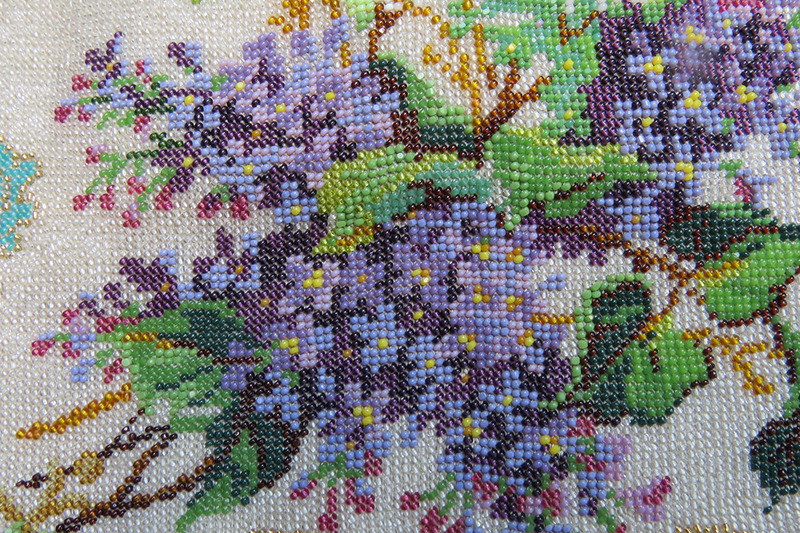 I must confess that even this small project is only half-finished, waiting in my to-do box for a time when my brain, eyesight, manual dexterity, and patience are ready to return to those tiny needles and beads. 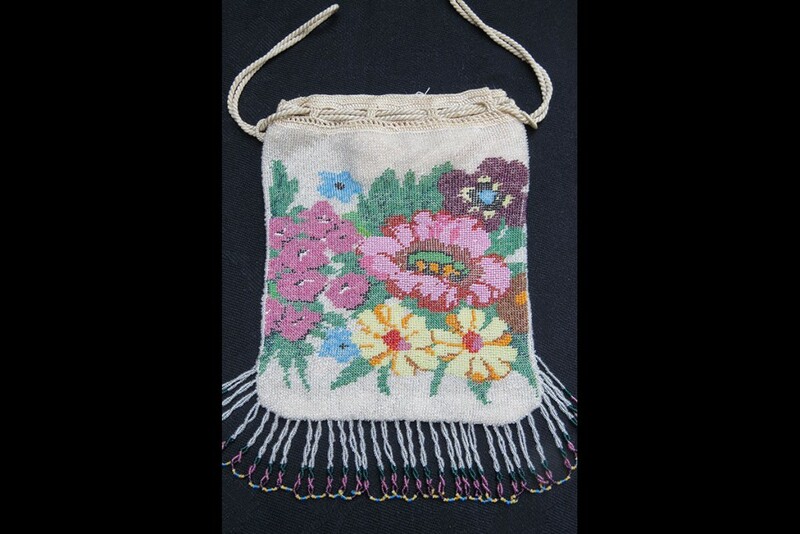 What became apparent in this class is the amazing, and very painstaking method of construction for my knit-in-the-round bags with multicolored designs and flowers. For these bags, the knitter started by stringing all the beads at once, following a detailed chart. 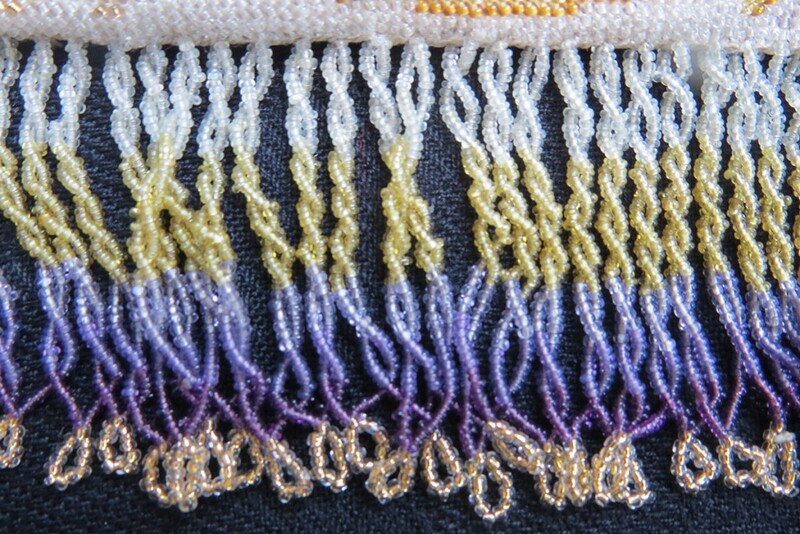 The chart is much like a knitted-lace chart, but instead gives the color for each bead. The beads must be strung in absolute perfect order, so when the knitter comes back around to the yellow flower with red center, for example, the beads coming up next on the thread are of the right colors! It’s possible to carefully break and remove a bead that is in wrong place, but it’s impossible to add a bead that was missed. This was astounding to realize, as some of the bags have more than 600 stitches and beads to the square inch! My collection now numbers about 100 bags. Some are in excellent shape, and others need some TLC and repair. Though I’ve always thought that would be a good retirement hobby, I haven’t yet started! Some bags are “junkers” that are beyond patching up. The tiny beads used in many of the purses are no longer available, so repairs will be impossible without taking beads from existing bags. Although I have taken bags to display for presentations to various groups, and I occasionally carry one for a special event, the bags remain in acid-free packing materials the rest of the time. 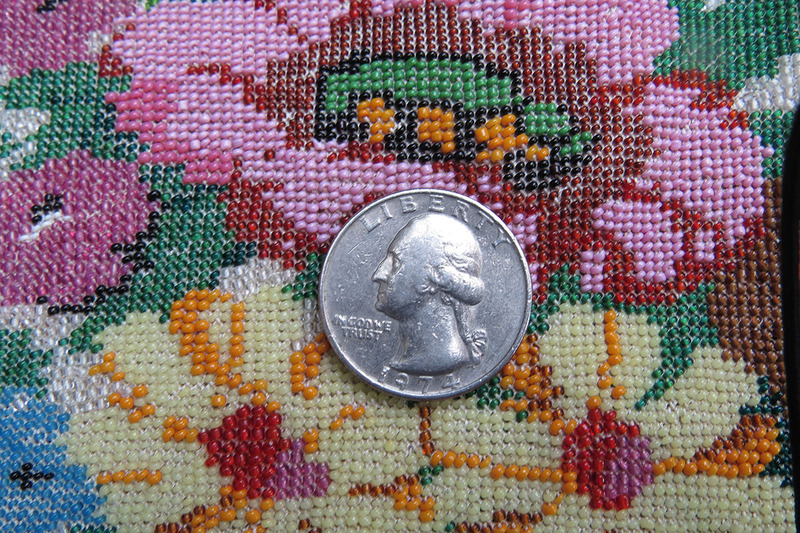 As much as I would love to keep them out, I don’t have horizontal display space, and hanging them, even carefully in frames or shadowboxes, can put too much strain on aging thread. If you’re in an antique store and see a vintage bag, ask to look at it. 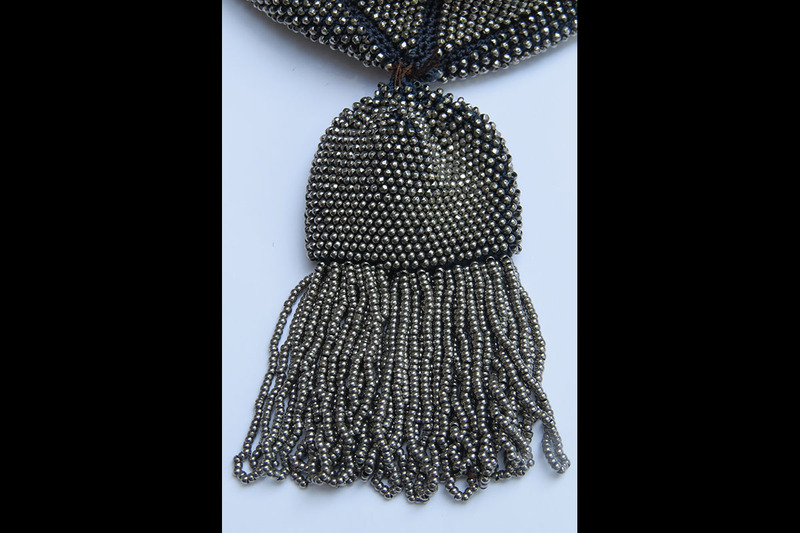 Take a moment to feel the bag and the beads, and to notice the construction. Think about what it took to create this bag. Even if you’re not moved to become a collector, as I was, you will enjoy this look at a very special knitting and crochet art.